Project Angel Food launched a statewide pilot program for people with Congestive Heart Failure (CHF) in April 2018. The purpose of the pilot is to prove our medically tailored meal (MTM) and medical nutrition therapy intervention can reduce hospital utilization rates and healthcare costs in 12 weeks. 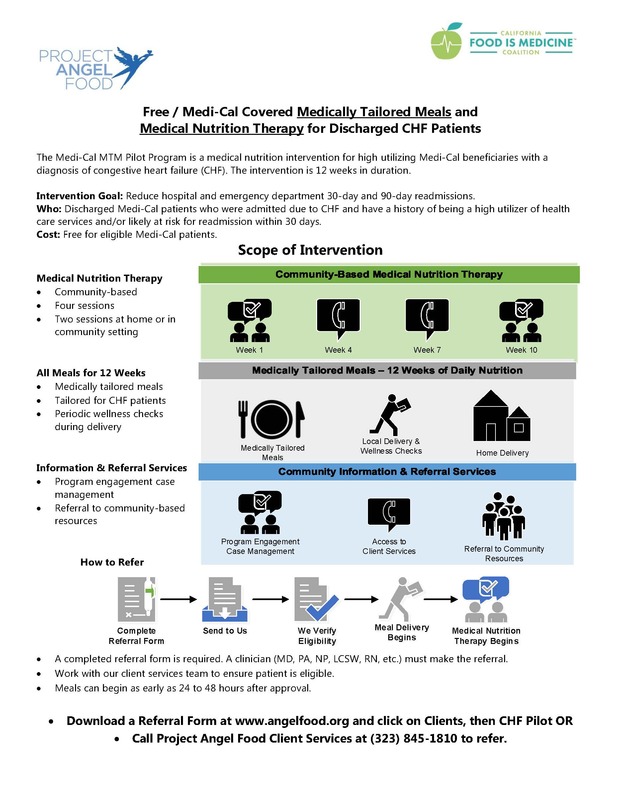 Our state directive is to serve 60 Medi-Cal patients with CHF (specifically, NYHA Class 2 and 3) the first year. We must serve their first meal within 7 days of being discharged to measure hospital utilization. We are seeking hospital partners serving San Fernando Valley, Metro LA and South LA to refer CHF patients as soon as they get discharged. If you would like to be a partner, please contact Vivian Kanchian, our Hospital Discharge Outreach Coordinator at 323.845.1800 or vkanchian@angelfood.org. FOR EXISTING PARTNERS: Click here to download our referral form. Once completed fax it to us at 323.845.1834. Feel free to contact us at 323.845.1810 if you’d like this form faxed to you. FOR INTERESTED CHF PATIENTS: Please refer to this CHF patient brochure. Spanish version will be available soon. Persons who are discharged to a living facility that provides more than seven (7) meals per week to residents. Patients released to a Skilled Nursing Facility are eligible within 7 days of discharge from SNF. Persons with severe aortic stenosis. Persons with limited physical, cognitive, or behavioral abilities that would interfere with their ability to follow-up with a finding as determined by their ability to receive the MTM services and follow up with survey interviews. Persons with anticipated life expectancy of less than a year.